He has had games with more touchdowns. He has had games with more yardage. If you're counting, Jameis Winston has games with higher ratings. As far as playing quarterback, however, as far as taking control of the game and spreading the ball around like a point guard on a fast break, Sunday was one of Winston's keeper games. It was the kind of game that will make you re-assess the young quarterback again. It was the kind of game that makes you feel good about the future. Can they get good together? Winston had the kind of game against the Bears that gives you hope. Against the Chicago Bears, the No. 12 defense in the NFL, Winston was sensational. He hit 23 of 33 passes (69.7 percent, second-best of his career). He threw for 312 yards and two scores. He made one of the maddest scramble-passes to Mike Evans (39 yards) that you can imagine. He threw a 43-yard touchdown pass to Freddie Martino. For most of the afternoon, Winston played behind a center from whom he hadn't taken a snap since training came of 2015. He played behind rookie guard Caleb Benenoch. Behind him was a rusty Doug Martin, who was running in quicksand. You know what else Winston did? He won at home for the fourth time, which made the ship look good and made the crowd feel good. He stopped a two-game losing streak. He made Dirk Koetter smart again. He restored credibility with those who suggested he didn't throw well enough deep or accurately enough short. In the middle of all of it, he was terrific. You could make an argument that it was the best game of Winston's career: It was the first time he has had a quarterback rating of more than 100 and threw for 300 yards. That's not a bad day's work. Consider this: Of Winston's 23 completions, 19 of them went to a guy not named Mike Evans. Sure, most weeks, Winston hears criticism because he looks so desperately for Evans. But not Sunday. Sunday, Winston let the Bears give extra attention to Evans until the second half (he had four catches after the half for 66 yards). Instead, Winston was a card dealer in Vegas. He was an orchestra leader. He was a choreographer. What he was was a quarterback. Humphries had five. Cecil Shorts had two. Martino, Martin, Luke Stocker, Brandon Myers and Mike James all had one each. There was nothing hurried, nothing that looked like guesswork, to Winston's throws. For a day, he looked like a quarterback who had arrived. "I don't really discriminate," Winston said. "I'm always trying to find other guys. I go through my reads. When Mike is having one of his big games, the story ends up being "Oh, Jameis is just throwing to Mike.' But why not? We want Mike to have those big games. But we do have guys in position to step up when he's not getting the ball." Of course, the biggest challenge of the NFL is to reach the point where a quarterback can do this every week. But on a day such as Sunday, it is easy to ask yourself this: What can't Winston do? What throw can't he make? Consider this play early in the third quarter. It was third and 10 for the Bucs at their own 38, and Winston dropped back to pass. Nothing. So Winston scrambled to the right. Nothing. He retreated into his own end zone. He did a dispsey-doodle and scrambled. Still nothing. He scrambled some more, the way a quarterback does when he is running toward catastrophe. You wondered if he was going to be tackled in the parking lot. Finally, he stopped and heaved the ball deep to Evans. The completion was for 39 yards. The pass covered 50 yards. Winston, frankly, made Koetter's headache go away Sunday. He wore a small bandaid given to him by safety Chris Conte. 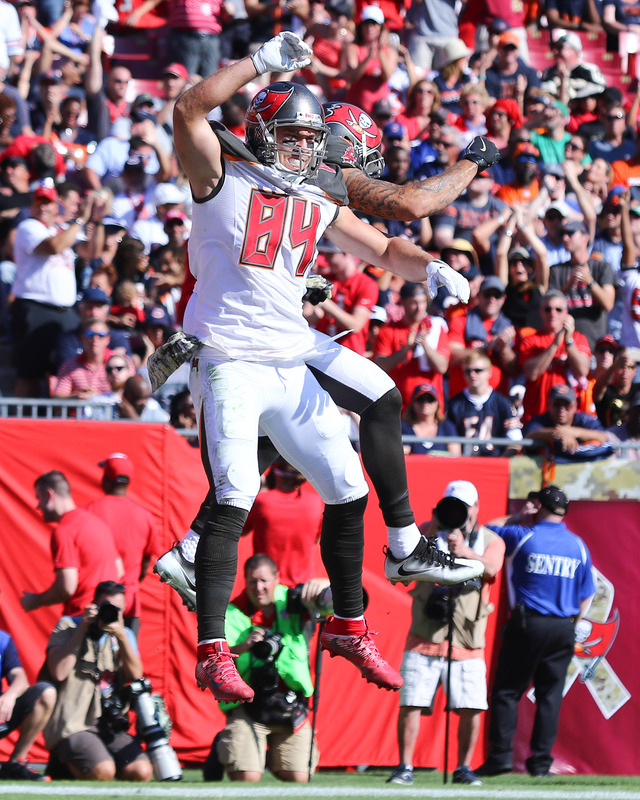 “Man, Chris Conte acts like he’s never scored a touchdown before," Koetter said. "When you come off after you score a touchdown, it’s okay to head bump guys who have helmets on. But when the coach is trying to give you a hug, he head-butted me right in the head, about broke my glasses, my hat was off." It wasn't the first time that Winston lifted his teammates. And that's what Winston has. He has this big play ability that will make your eyes pop. Sure, sometimes, his coaches have to tame him a bit. He's a wild stallion. But at times, he's just a marvelous beast. Since he arrived, the Bucs have won 10 times; in almost all of them, he's earned the big headline. One of the biggest lessons the Bucs must learn is that while Winston is the star of the show, they need some backup dancers. They need a defense to play the way it did Sunday (two interceptions, three fumble recovers, four sacks and a safety). They need a bruising offensive line. They need more speed. But in the NFL, you start to build with the quarterback spot. Winston remains a fine prospect. No, he isn't fully finished yet. But he's closer than he was last week. Next week, maybe he'll get closer still. Well said Gary. I hope the team can take this momentum to K.C.! How many more games do you think the Bucs need to win for Koetter to keep his job this year? The rest of the schedule looks tough but doable. They usually split the wins with the Saints but this year we might take them both, I am starting to like our chances better after yesterday’s win! GO BUCS! I think if he wins six, he’s fine. If he wins five (which would be one win the rest of the way), he’s probably going to win the debate. I wouldn’t feel safe with four although, eventually, the Bucs have to give a coach some time. Great game for the Bucs and the home fans who rarely see a win at RayJay anymore. I refuse to get high with the wins (even when helped by four turnovers) or too low after losses. I refuse to project success on Winston based on an occasional good game either. Win salvaged the season for now. Still skeptical. …..but I was skeptical about Trump winning as well. Skepticism is fine. But Winston is 22, and he has 40 touchdowns already. I think he’s worth hoping for. And I was really skeptical about Trump.